Winter heating bills can cost you a small fortune if you’re not careful, so we thought we’d share a few low-cost ways to prep your house for cold weather. We left out the obvious stuff like turning down your thermostat, drinking hot cider, and wearing six layers of Snuggies everywhere you go – the stuff in this list is a bit more creative than that. Enjoy! Even if you’ve got double-paned glass, you’re still likely losing heat through your windows. The problem is that glass just isn’t a very good insulator – but there’s an easy way to fix that: bubble wrap. The little pockets of air act like tiny little buffer zones that keep heat from escaping through the glass. It’s relatively cheap, too. You can get a gigantic roll of the stuff for around $10-20 bucks. To stick it to your windows, just cut out strips to match the size of each pane, and use a spray bottle to apply a light mist on the window. 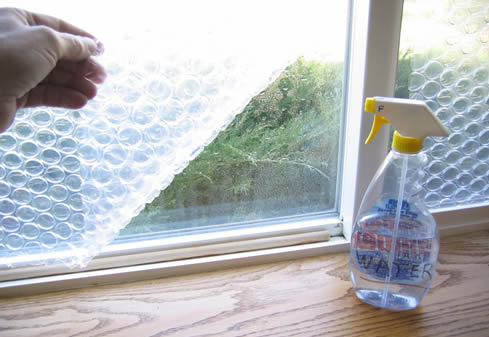 The water should create a seal that effectively holds the bubble wrap against your window. If it falls off, just give it another light spray and reapply. For those of you who want to insulate your windows without ruining the view, check out this window insulation kit from 3M. First of all, check to make sure your damper is in good working order. If you’ve got an older fireplace and the damper hasn’t been replaced in a few years, there’s a good chance that years of heating and cooling have caused it to warp, thereby exacerbating the problem of updrafts. Second, install a fireback. These are generally just sheets of reflective material placed against the rear wall of your fireplace in order to radiate heat back into your house. 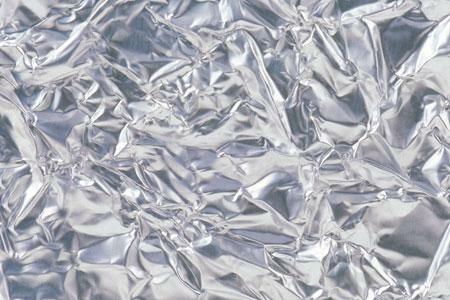 People typically use sheets of stainless steel to make this happen, but you can get the same effect for a fraction of the price by coating the rear wall with heat-resistant metallic silver spray paint, or even just tacking up some aluminum foil. That being said, the aluminum foil method will only work for deep fireplaces with sufficient room between the fire and foil to keep the foil from getting damaged/blackened. Lastly, if you don’t already have one, we highly recommend you get your hands on a glass fireplace door. They’re a bit on the spendy side, but they allow heat from the fire to pass through into your house while also preventing heat loss due to updrafts. We’re going to give you the benefit of the doubt here and assume you’re already aware of the importance of weather stripping your doors and windows to reduce drafts – but what you may not realize is that your outlets and switches might be causing just as much heat loss. Sure, the drafts escaping through any one outlet aren’t that significant, but with all the outlets in your house combined, those little drafts add up to a pretty substantial leak. 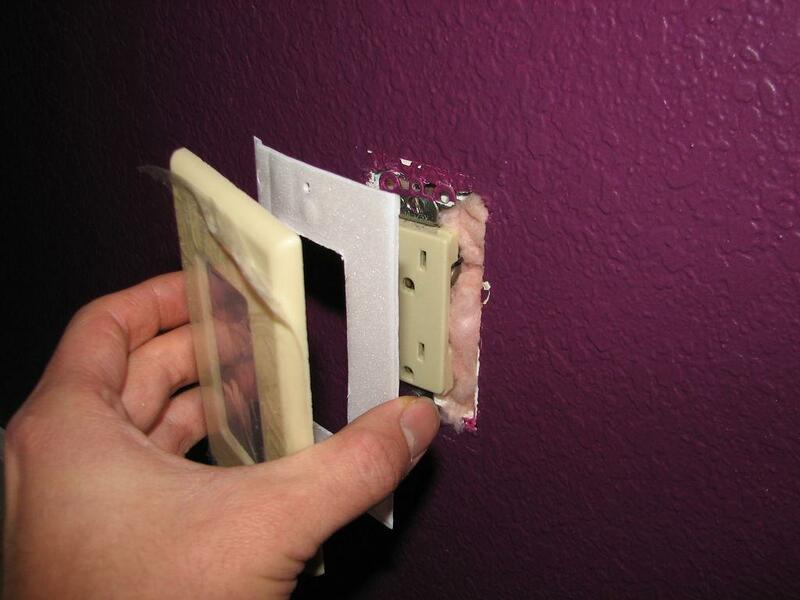 If your outlets aren’t already equipped with foam insulation pads, installing some is a great way to fight the draft. You can pick them up from your local hardware store for just a few bucks, and they can easily be installed in an hour or two using nothing more than a screwdriver. If you want to take things a step further, we’d also recommend caulking the perimeter of the outlet boxes to the surrounding drywall. No only will doing this help moisten up the dry winter air in your house and stave off things like nosebleeds and dry skin, it’ll also keep your house warmer. 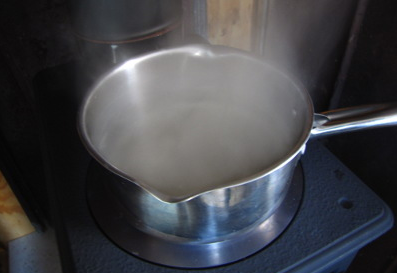 Having even just a little bit of moisture in the air helps it retain heat longer, so if you’ve got a wood stove blazing away all the time, all you need to do is put a pot full of water on top. As it heats up, the water will slowly begin to evaporate and humidify the room. *Pro tip: put a little bit of apple cider vinegar into the water to help keep the pot from developing mineral rings on the sides over time. Drafts coming from outside your house are one thing, but drafts between rooms can be just as troublesome. You can save a lot of money by selectively heating certain sections of your house, so cutting down on air movement indoors is equally important. 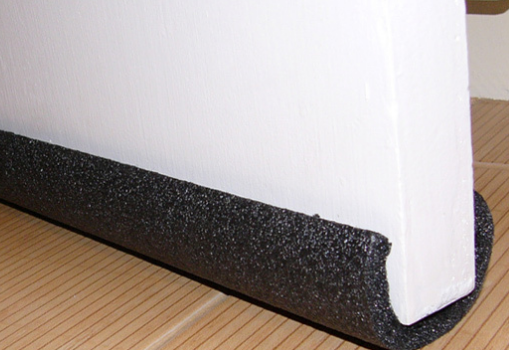 There are plenty of ways to do this, so rather than spending a bunch of money and an entire afternoon installing door bottom seals, you can combat inter-room drafts on the cheap with some pipe insulation. This stuff is extremely inexpensive and comes in various thicknesses, so make sure you get a size that’ll fit snugly under your door. Know any other tips for cutting down on winter heating costs? Share them with us in the comments!